Whether you’re a brand new beginner or a seasoned veteran, we have classes that will be the perfect level for you. Our coaches are experienced instructors able to break down complex techniques in our Fundamentals, Level 1, and All Levels classes so that if you’re new, you’ll be able to jump in and pick up the material quickly. If you’re already an experienced fighter, our coaches have all competed at high levels and bring years of experience training and coaching to help you progress. What do the levels on the schedule mean? In BJJ, we follow the traditional belt ranking system. 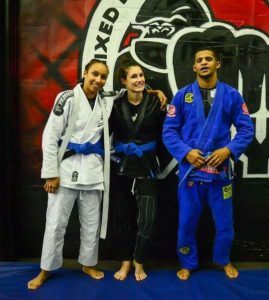 You work your way through the belts beginning at white belt, then earning blue, purple, brown, and finally black. Along the way you receive stripes that mark your progression towards the next belt color. As a white belt, after you attend 30 classes, then you’re eligible for a stripe. Once you are eligible, then your coach will determine when to award you the stripe. The higher ranking your belt, the more classes you need to attend to be eligible for your next stripe. Anyone can take the Level 1 or All Levels classes without any prior experience. These classes will cover foundational techniques, progressively preparing you for the Level 2 classes. Typically, it takes around 20 classes to be ready for the next level, but that’s a general guideline. Level distribution is always at the discretion of the coaches. This is important for safety reasons, as well as to make sure that each member has the best possible learning experience. You are always welcome to ask your coaches what you should be working on in order to be ready for the next level.